If you are in need of a top rated Rochester MI Painting Service, please contact SJB Painting at (248) 802-7465 for a free estimate. Click here to see photos of our work or read our excellent reviews on Google! There are a number of improvements that increase the value of your home; for example, upgrading the windows has an aesthetic function, but can save you money on energy bills, and renovating your kitchen can increase both form and function of a crucial room in your home. When going over the possibilities, a fresh coat of house paint may seem like a trivial, or superficial addition. However, there are some key logistic benefits to painting your home’s exterior. The truth is, painting holds both aesthetic and functional advantages for your home. Some of these will kick in immediately, improving your home’s qualities, while others accumulate over time as cost-saving measures. If you’re considering a new home upgrade, start by recognizing these seven benefits of exterior house painting. When you first moved into your house, you may have had different tastes—or may have hated the color of your home from the beginning! Even if you loved the color (and still love it), after several years of the same thing, you might be ready for a change. Don’t neglect the aesthetic value that house painting can bring; you’ll see something newer and livelier every time you pull in the driveway, and that goes beyond a simple color choice. A fresh coat of paint can make your siding seem newer, putting your whole house in a different light. When the appraiser comes to evaluate your house, a recent house painting job can have a major effect on the final value. Some major renovations only offer a partial return on investment; for example, kitchen remodels average only an 80 percent return on investment. This means a $10,000 kitchen makeover would only increase the value of your home by an average of $8,000. Exterior paint, on the other hand, offers a much more attractive return of 141 percent. If you end up spending $1,000 on house painting, you can expect a home value increase of roughly $1,400—which is like earning $400 of extra value on top of the job paying for itself. The aesthetic value of your house isn’t just for you; if you’re interested in selling your home, exterior paint can greatly increase your potential curb appeal. Curb appeal is independent of both home value and personal appeal (though it’s related to those factors); instead, curb appeal is all about setting the right tone when a prospective buyer sees your home for the first time. Think of it as getting your “foot in the door” for a potential sale—if they like the appeal of the exterior, they’ll be far more likely to venture in for more details and stand a better chance of actually buying. Nature can be harsh on your home. Rain, wind, sleet, snow, insects, and fire are just a handful of the natural elements that could potentially damage your home—and the right paint can resist nearly all of these (to a degree). Think of paint as a protective, shield-like outer coating for the siding of your house. It can prevent moisture from seeping into your home, preventing the outlandish costs of mold and mildew damage. It gives an extra layer of protection against direct precipitation damage. It can even stop insects from infesting your exterior. Speaking of insects, termite damage is a major killer for wood-based homes; being able to identify this problem (and address it) proactively is crucial if you want to save yourself some extremely expensive foundational repairs. Evaluating your home’s siding before adding a fresh coat a paint can help you identify any possible insect damage early, and adding the paint itself can help stop an infestation in its tracks. 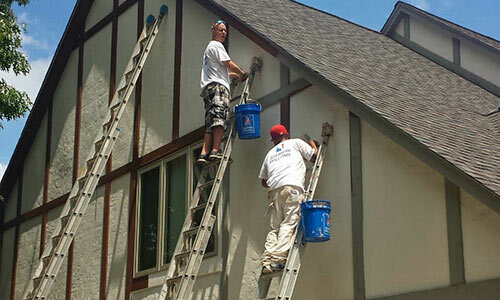 For an experienced Rochester MI Painting Service, please call SJB Painting at (248) 802-7465 for a free quote.